I hope I can express myself clearly enough for anyone reading it to understand how Paula and Juan, the owners of this magnificent estate, were an indispensable part of our great day. Not only are they impeccable professionals, they are great people, father and daughter facilitated the whole process from the beginning, they helped us in everything we needed and more. We feel unconditional support at all time! When you choose Cortal Gran to celebrate your wedding, not only do you rent a space, but what this family can offer you in help and support is unimaginable. In our case it was the first venue we went to visit, we had no references, but we had seen some photos and it seemed like a magical space. After seeing the venue and getting there to know them we didn’t need to visit any other place. Just a visit and a conversation were enough to realize that this place could make our wedding a precious story. Thank you for everything Juan and Paula. Cortal Gran was the first venue we visited to celebrate our wedding. After many searches on the internet, and always finding some fault to everything we saw it, we found this paradise at Costa Brava and felt a tingle. We contacted Juan, the owner, and in two days we went to see the place in person. We just got in the venue and and we knew we had hit! I remember telling my husband, "I'm getting married here." From the first moment we had a very good feeling with Juan and his daughter Paula, who always helped us to make our day perfect. Being in Cortal Gran is like being at home, and Juan and Paula feel as if they are your family. During the year we had ahead we could go visit Cortal Gran whenever we wanted without any problem. They advised us in dozens of details, and whenever we came up with any doubts a phone call or a whatsapp with them, they gave us back the peace of knowing that everything was under control. We have only good words. A little bit our heart has been impregnated there, among its gardens, its flowers, its apple fields. It is a place that gives off magic, and will always be part of us. Cortal Gran was a love at first sight! It was the first site we visited and we no longer need to see anything else. It’s a magical place where dreams come true. Beautiful in any season of the year. It has a thousand wonderful places where you can imagine your ideal wedding. A venue with history, personality and very good taste. In Cortal Gran you will breathe 'good vibes' from minute zero and that is thanks to Paula and Juan, the owners, a pair of brave people who leave their heart and soul to make everything come out perfect without losing their smile. Everything is nice and easy by your side. They have become, besides great professionals, friends whom we will always carry with us. Thank you! We fell in love with his photos and we fell in love again when we went to see the venue. When we arrive we can imagine us there celebrating our wedding and for that reason we choose it. We wanted a venue where we could personalize everything and do it our way. And Cortal Gran offers several possibilities to celebrate your wedding as you want. In our case, we chose a ceremony in the spectacular Courtyard, but we had to change plans in the last minute for the rain and celebrate it in a covered arch full of magic. Despite the rain, we had the most beautiful ceremony that we can imagine. Thanks to the whole team, including the hosts Paula & Juan, who moved and adapted all Plan B to make it incredible. From our experience, we can assure that Plan B can become equal to or more beautiful than Plan A. The best day of our lives… Many thanks to Juan and Paula for their help, good vibes, flexibility, kindness. It was the wedding of our dreams. A very cute place perfect to do the ceremony, cocktail, dinner, party until the end of the night, with many options to organize everything, also the pool was perfect for brunch the day after the wedding. We would like to have our wedding again! Maybe for the anniversary. We'll be back, that's for sure. Choosing Cortal Gran has been one of the best choices of our lives. 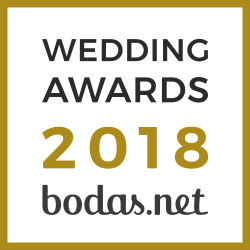 We recommend it a 100% for thousands of reasons such as: the friendliness and closeness of Joan and Paula, the matchless setting, the ease and freedom to choose the furniture, the help they gave us before wedding and also during the big day, etc. We got married in November and it was a wonderful day, we were very confident because Plan B was just as nice as plan A. Also, we chose Paula’s open bar and we are so glad we did! All the waiters were wonderful, attentive to the guests and emitted very good vibes. If you go to view Cortal Gran you will fall in love with it! Cortal Gran is a lovely place, with lots of cachet. There are many options to customize your wedding, with its varied facilities and all the material that you can use to decorate your event. It is perfect for weddings with children, who can run around the estate in full safety. Juan and Paula are very helpful and attentive to meet all your needs and ensure that your day is special and that everything is going well. They pamper you and help you in everything they can with great kindness. They are very flexible and you can visit them as often as you need. Everyone was delighted by our choice and had a great time. We chose Cortal Gran for several reasons, and we knew it would be the right decision from the first moment. The castle and its surroundings are spectacular; it's big, beautiful and has everything you need. We got married in April, so the weather was a bit unpredictable, it could turn out to be a great sunny day, but there were also chances of rain, cold, Tramuntana winds… etc. For this reason it was important that Plan B was just as perfect as plan A. They have an indoor / outdoor living, with a porch that can be opened or closed to the exterior depending on the weather (a decision that can be made in the last minute) and where they fit all the guests. Finally we had a sunny day and were able to celebrate an outdoor wedding, the ceremony in the field of flowering apple trees, the aperitif in the courtyard of the castle and the banquet in the garden with tables, chairs and sofas that scattered the beautiful garden. Juan and his daughter Paula make everything very easy, they offer maximum freedom to make your wedding as you like, and have all the necessary contacts for the organization but you also can make your move as we did. There are very few additional things you need to make the place perfect, because Cortal Gran already has everything. We recommend it without a doubt, for the good treatment and professionalism; they made us feel special and confident in every moment. And so, we had an outstanding wedding, we would rate it 5 stars. We are already looking for an excuse to celebrate something else and do it there. Thanks for everything! When we arrived to Cortal we were absolutely captivated by this beautiful and vast estate of medieval style. Later, the charm and willingness of Juan, the owner, and her daughter Paula made us opt for this option. In hindsight, we can say that the success was huge. All their recommendations were very wise. They helped us to make the right decision regarding the catering, flowers and even the church when our main option failed. The fact of having Plan B in case we couldn’t use the garden for aperitif and / or nightclub (the Tramontana is typical there), made us decide for this venue. To sum up, it is an idyllic place and team to organize any event.